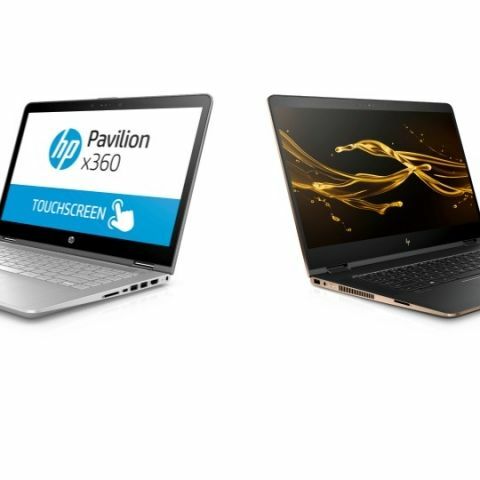 HP has launched the Spectre x360 and Pavilion x360 convertible laptops in India. The HP Spectre x360 13.3-inch model starts at Rs. 1,15,290. The HP Pavillion X360 11.6-inch model starts at Rs. 40,290, while the 14-inch model starts at Rs. 55,290.All devices are available with 7th Generation Intel processors with support for Windows Ink, an up to 4GB Nvidia dedicated graphics. The HP Pavilion x360 is available with options for the 7th Intel Core i3, i5 and i7 processors. There is also an option with hybrid storage consisting of 1TB HDD and 8GB SSD. Both variants of the laptop feature a multi-touch IPS FHD display as well as a full size textured island-style backlit keyboard. The device comes with Bang and Olufsen speakers with HP Audio Boost. The company claims that the Pavilion x360 offers up to 10 hours of battery life with support for fast charge. The HP claims that the Spectre x360 is one of the thinnest and lightest convertible PCs with a thickness of 0.55-inches. It comes with a 13.3-inch FHD IPS display and offers an option between Intel’s Core i7 and Core i5 processors. The laptop offers 16GB of RAM and storage of up to 512GB PCIe SSD. Like the Pavilion x360, the Spectre x360 also comes with Bang and Olufsen Audio with HP Audio Boost along with Smart Amp. The device supports HP’s Fast Charge technology and the company claims that the device can offer up to 12 hours and 45 minutes. The HP Pavilion x360 14-inch, and Spectre x360 come pre-bundled with HP Active Pen. HP Pavilion 15-p001TX or HP Pavilion 15-p036tu. HP Pavilion Bc-406Tx Or HP Pavilion 15-cw0027au?